I'd rather Kim get the Dragon Shield permanently. I feel like she did more with it in two issues than Jason did in four, hehe. They could turn it into a shared power-up. After all, the way it works is that if you possess the green power coin when you morph, you can summon the Dragon Shield (as is the case for Jason), and if you already have the shield, it can be transferred to another ranger - as happened when Tommy passed it to Zack in An Oyster Stew. 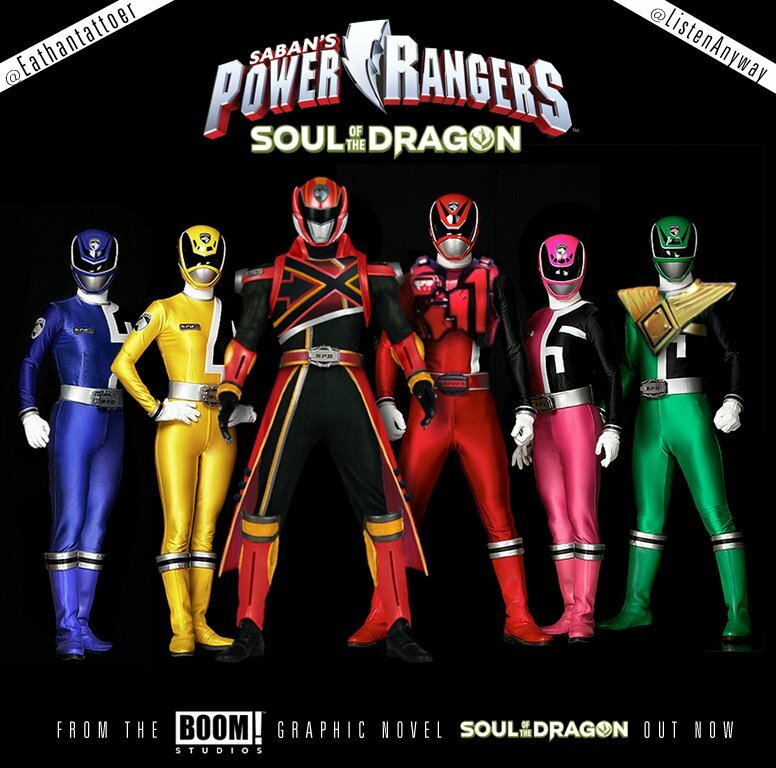 Don't know if this is still a spoiler, but here it is the Soul Of The Dragon future SPD in real life version, an image made by @eathantattoer and me. UPDATE: I realized Red's armor needs some color retouch and Deka's belt insignia too, so I will be updating it soon. Last edited by Soulspice; January 12th, 2019 at 02:40 PM. Same. I'd like to see Billy and Trini using it since they're the only ones to have never used the shield in either the TV show or the comics. Wow that is totally awesome do you have an image of just Deka ranger on his own ? This week, I've read Go Go second volume. It remains quite danm good. Parrot gets the O5 voices just right and make them speak and like modern teen while retaining everything they were in the TV series. I think I like it more than Kyle's run. And that's saying something because I love Kyle's work. While I'm not 100% sold on the head, THIS is a far better "more robot-y" redesign of Alpha than the 2017 movie gave us. Everything on Boom-verse is better than the movie. I would LOVE a boom inspired movieverse! Honestly, I'd like to see the 2017 film to have a comic book ongoing as in after the events of Aftershock, along with a crossover with MMPR Boom. Quick question: does anyone have a HQ pic of issue 6's movie variant cover? Preferbly with only the art. You mean like Cam's Green Samurai Shield? I'm pretty late to the party, but a friend got me this for Christmas. The weighted clothes that meant nothing for 99% of Z. And the Dragon Shield doesn't work like that. It's not a limiter it's added defense. Yes. Goku's Boots. and wrist bans iirc,but Cam's Samurai Armor works the same way. Notice how it caves in a concrete sidewalk whenever he removed it to go into Super Samurai mode? Doesn't look as impressive as Vol 1 until you see that the Papercutz comics are 50 pages and that Vol 1 split issues by their individual stories. My only complaint is that the Papercutz Free Comic Book Day issue isn't included. I dont know WHY. I'll try emailing Boom to see. Otherwise, still excited for this volume. It also confirms no Power Rangers vs. Beetleborgs, but that one being MIA is a lot less surprising. It's too bad the PR comic license was dormant for so long. Some weird and ugly In Space and Lost Galaxy 90's comics would've been great. Last edited by MrsManface; January 15th, 2019 at 12:11 AM. Tpp bad maybe 3rd book will get it right! Well, I just leafed through the book (well, the Comixology version of leafing) and I'm impressed to say the least. Still not the greatest restorations but looks ok.
, which I consider a nice touch. Boom included issue 1 of THEIR series as the last comic, between the last Megaforce issue and the pleasant surprise above. 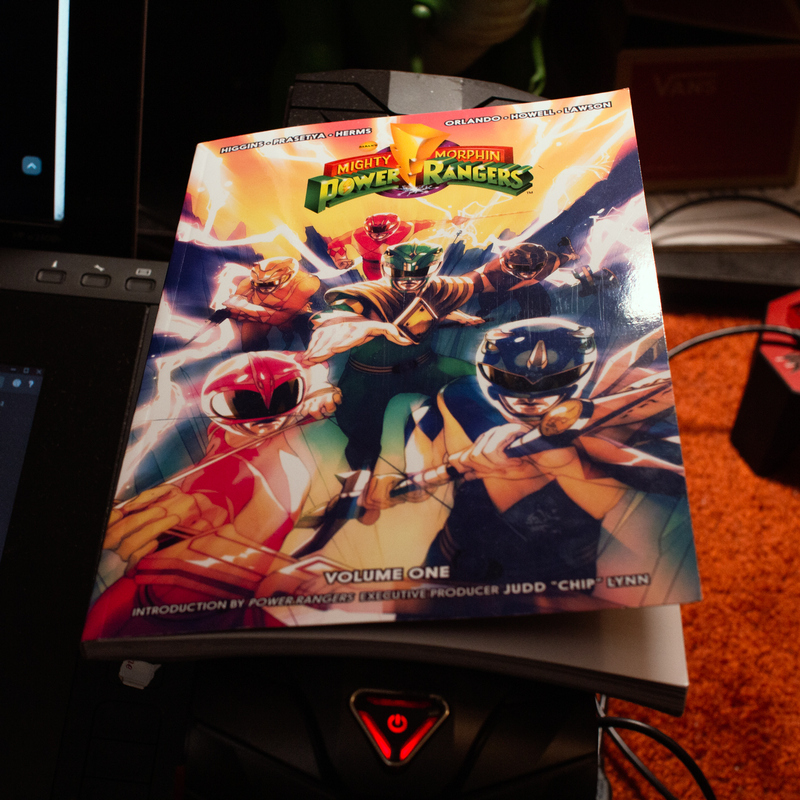 I'll give them credit for not including issue 0 for the third time (after the 2017 sequel and Soul of the Dragon), but when I buy the MMPR Archive, I'm expecting the older comics, not Boom's. Volume 1's still for sale and you can get issue 1 digitally; it's not out of print like the older comics. I probably wouldn't be so teed off if By Bug Betrayed was included, but as it is, there was a space for By Bug and it got taken by a comic that didn't need to be reprinted. Don't let this put you off from getting this book. I'm just venting and it's still great we got the older comics, minus Turbo vs Metalix and... well, you know. I'll try and figure out why Boom did this but, in the meantime, let's at least enjoy the other issues and bonus stuff.